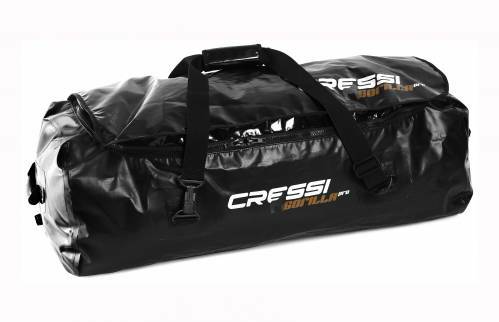 Gorilla Pro is the evolution of the legendary Gorilla, the bolsa Cressi professional use. It is made of durable PVC laminate Tarpaulín termosoldad by high frequency tens thick 5: virtually 100% waterproof and therefore not practical to wet the trunk of the vehicle. It has two strong handles welded at each end, useful for transportation, especially when the bag is very charged, and a system of loop-strap with hooks and accessories especially resistant loads that allow very important. YKK zipper is 8pitch © plastic (like costumes) with double cursor. O configuration for a very wide opening of the storage space and perfect access and ease of installation of the equipment. Covered by a flap with Velcro ©. Base plate with reinforcement termosoldada of 1,2mm thick to prevent drilling for soil contact points incisors. It has a unique and practical drainage system for waste water in one of the ends. It roscable and can be extracted quickly to empty the bag. Availability of spare plugs. Its size (90cm x 38cm x 32cm) is ideal for adding a complete team, even the longest fins or apnea diving.